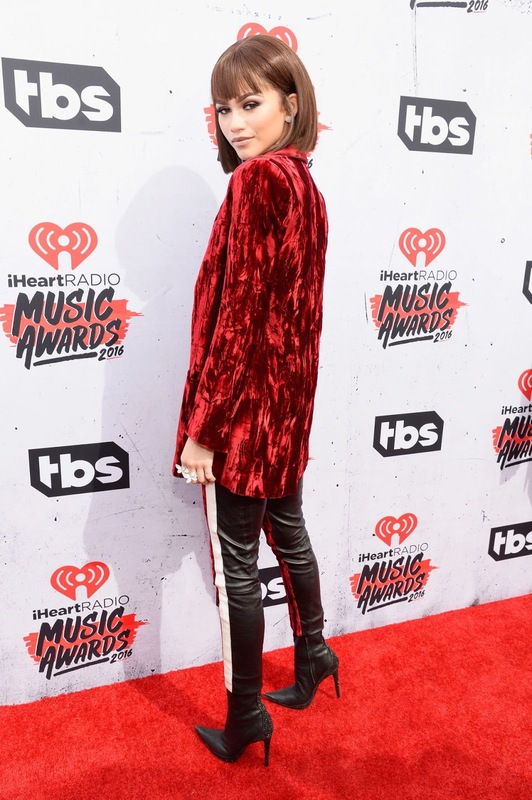 After her fierce and edgy look at the GLAAD Media Awards 2016, Zendaya arrived at the iHeartRadio Music Awards in another bold look. The 19 year old music artist wore a leather bralet and a crushed velvet suit red suit, giving her a fashion forward appearance. Her bold look was paired with a blunt bob wig which compliment her style perfectly, and the leather bralet showed off her abs. Zendaya sported smoky eyes and glossy pink lips, and completed her style with a pair of black booties.